The former caretaker Chairman of the Peoples Democratic Party, Ahmed Makarfi, has warned the party to be careful about the type of persons it accepts back into the party. The former Kaduna State governor spoke on Friday in Lokoja, the Kogi State capital, during a visit to the party’s secretariat in continuation of his nationwide tour to solicit support for his presidential ambition. Makarfi said that those who left the party when things were rough and now returning because they could not realise their ambitions elsewhere, should not be trusted with too much responsibility. He warned against a repeat of the past where crisis engulfed the party immediately it lost the last presidential election. Makarfi also warned those clamouring for restructuring to be careful so as not to hand over the responsibility of restructuring to those who should not be trusted with power. 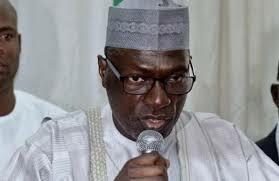 While wishing him well in his presidential bid, the state party Chairman, Sam Uhuotu, said that Makarfi had proved his worth as a good leader with the way he handled the crisis in the PDP when he was the caretaker chairman.